A new Gravis Marketing Poll of likely voters in the key swing state of Virginia released on Tuesday found Mitt Romney with a 5-point (49% to 44%) lead over President Barack Obama. 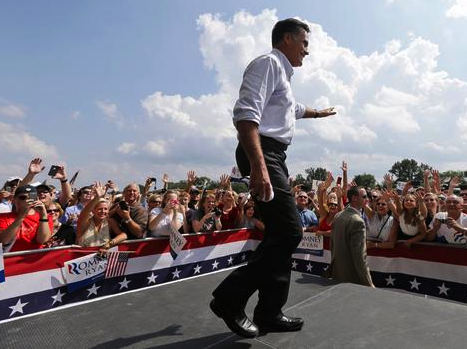 The same poll in August had Obama leading Romney by four points (44% to 40%) in Virginia. The poll surveyed 2,238 likely voters in Virginia from September 8-9 and discovered while Obama remained at 44%, Romney gained 9 percentage points by winning over voters who had previously been undecided. Fifty-three percent of those surveyed in Virginia said the country was headed in the wrong direction even tough Virginia’s unemployment rate is under 6%, well below the national 8.1% unemployment rate, which was only lowered last month because 368,000 people gave up looking for work and left the workforce in August. Only 36% of Virginians said the country was headed in the right direction, and Gravis Marketing found there was “very little gender difference” on this question, which may explain why the Obama campaign is trying to court women voters in Northern Virginia by instigating and playing up the “war on women” culture war.